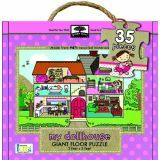 There are so many rooms to explore in this beautiful dollhouse. 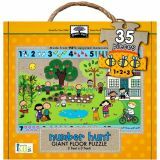 Kids will love discovering all the unique details within this charming giant floor puzzle. 35 oversized chunky pieces in a durable carrying case. 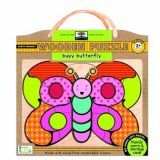 This puzzle is printed on 100% post-consumer recycled material with eco-friendly ink. Assembled puzzle measures 2' x 3'. 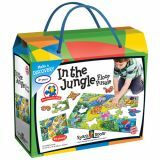 A busy garden scene turns into a hunt-and-find adventure as kids build the puzzle and count the objects hidden in the garden. 35 oversized chunky pieces in a durable carrying case. 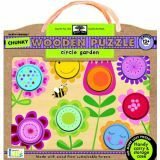 This puzzle is printed on 100% post-consumer recycled materials with eco-friendly ink. Assembled puzzle measures 2' x 3'. 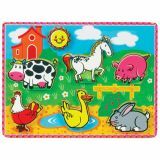 With pigs, cows, horses, and more, it's a busy day on the farm. 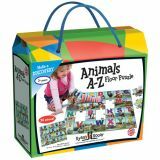 Kids will have a blast assembling this fun puzzle to see all the different animals. 35 oversized chunky pieces in a durable carrying case. 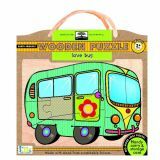 This puzzle is printed on 100% post-consumer recycled material with eco-friendly ink. Assembled puzzle measures 2' x 3'. 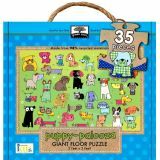 Kids will love putting together this giant floor puzzle full of colorful, adorable dogs. 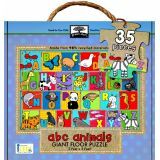 35 oversized chunky pieces in durable carrying case. 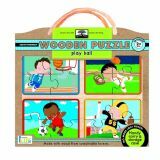 This puzzle is printed on 100% post-consumer recycled material with eco-friendly ink. Assembled puzzle measures 2 'x 3'. One big, central image is divided into 14 pieces with only black-line outlines underneath. 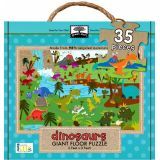 This unique jigsaw is suitably challenging and accessible for little ones who are ready for multiple-piece jigsaws but are not quite ready to lose the tray support. 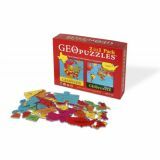 Four mini jigsaws in separate wells are each divided into four pieces. 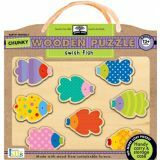 With slightly more detailed scenes and only background support underneath, these puzzles are perfect practice for young puzzlers. Fun, colorful illustrations of jungle inhabitants--zebra, monkey, tiger and more. 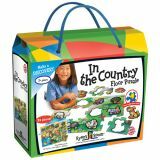 A giant 24-piece floor puzzle-within-a-puzzle. 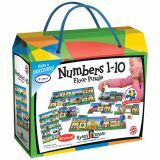 12 smaller puzzle pieces fit into 12 larger puzzle pieces for twice the fun. 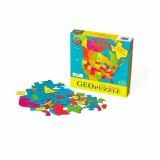 Durable, sturdy puzzle pieces. 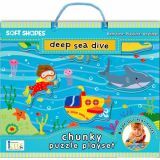 Assembled puzzle measures 19"H x 27"W.
Realistic sea creature images on a colorful illustrated background. 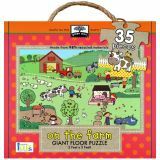 Giant 30-piece floor puzzle is durable and sturdy. 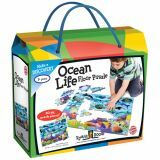 Assembled puzzle measures 19"H x 27"W.
Kids will love discovering the deep blue seas with an underwater scene made of chunky foam. An octopus, shark, diver, and more pop out for play. 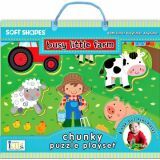 6 chunky pop out pieces in a carry-along tray for fun on the go or in the bath. 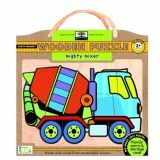 Bright wooden puzzle with super chunky puzzle pieces. Bold designs capture young children's interest. 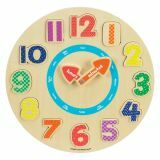 An excellent way to teach kids to tell time, as well as learn numbers! 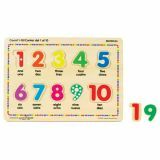 Numbers can be matched in the correct order: hour and minute hands spin around. Clock is 11 1/2" in Diameter. 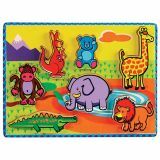 Colorful images to help children learn to group like items and expand their vocabulary. 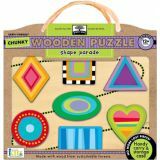 Puzzle have wooden knobs making each pieces easy to hold. 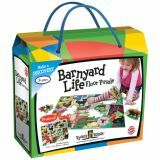 Promotes the development of fin motor skills.